A lovely short walk takes you from the large water tank just off Patonga Drive in Umina, along an old trail and track to two fantastic fenced lookout platforms. But probably the best view is from a few unfenced rock platforms about a third of the way along the track. It will lead you straight over to the cliff face. Immediately below is beautiful Pearl Beach. Beyond that it is easy to see Green Point at its southern end, then a desultory strip of beach. South of that, the land ends at the estuary of the Hawkesbury which lies at the western end of Broken Bay. The views over the bay, usually dotted with white sails, are excellent. Lion Island lies in the middle. The land to the far left with the lighthouse is Barrenjoey Head. Around the corner facing out to the ocean is Palm Beach, the most northerly of Sydney's northern beaches. Just to the right of Barrenjoey is a large inlet which recedes southwards known as Pittwater. To the right of that is West Head on the north-eastern corner of Ku-Ring-Gai Chase National Park which follows the southern shore of the Hawkesbury River as it disappears around the corner to the far right. Looking straight across Brisbane Water is Box Head at the southern tip of the western shore. It is a great spot on a sunny day or for a sunset. This image belongs to the travel and nature stock photo library. This stock photo of Pearl Beach from Mt Ettalong Lookout is available for licensing for commercial and editorial uses including websites, blogs, books, magazines, brochures and advertising. Restrictions may apply for images which contain third party copyrighted material or sensitive subjects. Photos of artwork are for editorial use only. 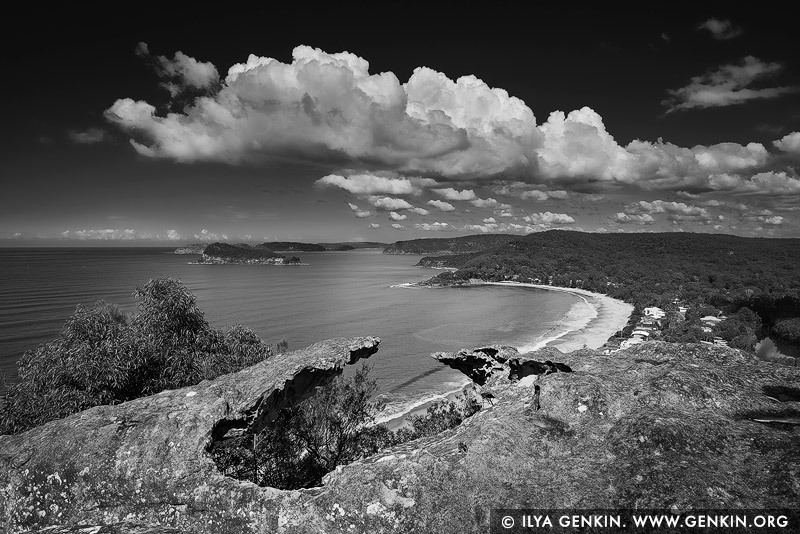 This image id AU-MT-ETTALONG-LOOKOUT-0001 of Pearl Beach from Mt Ettalong Lookout, is copyrighted © by Ilya Genkin. This is not a public domain image.